A vehicle overturned on the A259 Barnhorn Road this afternoon causing long delays, according to Sussex Police. Police said they were called to the scene of the one-vehicle road traffic collision, close to the Bexhill service station, at 12.31pm. Sussex Police said the vehicle, travelling west, struck a tree and overturned. Officers were joined at the scene by crews from South East Coast Ambulance Service (SECAmb) and East Sussex Fire and Rescue. One ambulance crew attended the scene and one patient was assessed and treated before being taken to Conquest Hospital, according to SECAmb. 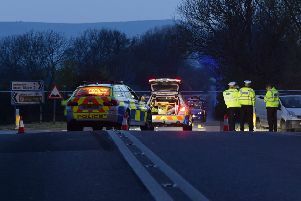 A police spokesman said the road was not closed but there were long delays in the area.